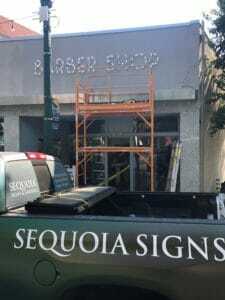 We recently had the pleasure of producing and installing a new set of channel letters for Straight Edge Barbers in Walnut Creek. 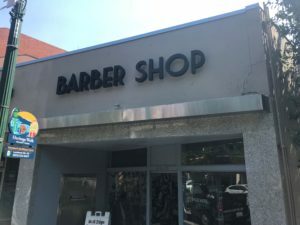 Straight Edge is a great place to get your hair cut! 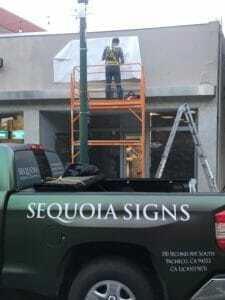 They recently relocated and wanted a handsome set of channel letters for the building. Like all custom signs, channel letters come in many shapes and sizes. The most common variety are face-lit channel letters which are made with an acrylic face, usually covered with translucent vinyl, and lights inside the ‘channel’ that light up the face at night. Another type, however, is becoming increasingly popular and preferred by many municipalities- Halo lit channel letters. These are also referred to as ‘reverse’ channel letters as the light comes out the back of the letter. Just like traditional letters, the lights sit inside the channel, but the face of the letter is painted aluminum. The channel opens at the back and the letters are positioned a couple inches off the wall so, at night, the light shines against the building wall and reflects back, creating a halo effect around the letters. 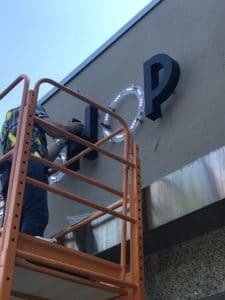 Installation of channel letters, while not terribly complicated, takes a few steps that we show here. First, our installation crew needs to set up a pattern on the façade that shows them where to drill the mounting holes. Each letter requires four mounting screws in addition to a hole for the electrical wires to pass. After that, with halo letters, we install all the backs (clear acrylic with the lights attached to them). While this is happening, another member of the crew is inside the façade connecting all the wires. Before we move further, we turn the sign on to make sure all the lights are working. And there you have it. 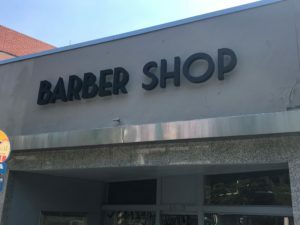 An elegant sign for an elegant Barber! If you are in Walnut Creek, give them a call!